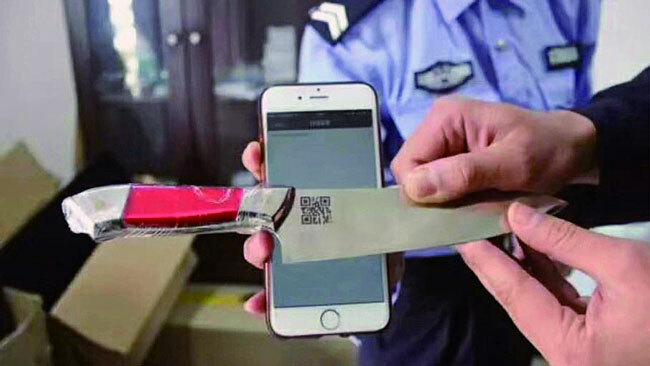 Chinese police examine a QR code affixed to a knife in northwestern China's Xinjiang Uyghur Autonomous Region in an undated photo. Authorities in Aksu prefecture in northwestern China’s Xinjiang region have begun implementing a government policy to affix identification codes to knives belonging to Uyghurs as a futher security measure in the restive area, sources from the prefecture said. The policy of applying QR, or quick response, codes to knives is part of new security rules requiring owners to have their cutlery registered and stamped so that it can be traced to them in the event that the knives and choppers are used to commit acts of violence. The two-dimensional barcode is a machine-readable optical label that contains information about the owner who has purchased the knife. Residential committees, which ensure Uyghur residents comply with official government policies, are responsible for implementing the QR code policy. A Han Chinese woman who works at the Xinxing community center in Aksu (in Chinese, Akesu) told RFA’s Uyghur Service on Oct. 9 that notices about the policy have been sent to various districts in the prefecture, though the measure has yet to be rolled out in some locales. She went on to say that the local residential committee had received a notification from authorities on Oct. 6, but had yet to forward it to the community center. Also on Monday, a female Han Chinese staffer of the Jinshi Residential Committee in Aksu confirmed that the district received the notice and implemented the policy the previous week, but she abruptly hung up the phone when asked about policy’s purpose. A Han Chinese woman who works at the Yuequan Residential Committee in Aksu told RFA that the district is putting the policy into action. “Every household in every building must implement it,” she said. Designated companies and organizations are creating a quadrangle-like seal to mark the knives with the codes, she said. Employees at a company on Kabei Road have been assigned to apply the codes to knives in Yuequan district and will begin the work on Wednesday, she said. “Even if some people hand over their old axes and knives directly to police stations in their neighborhoods, we have their phone numbers, and you can call them directly for details,” she said. A female Han Chinese staffer of the Xingfu Residential Committee in Onsu (Wensu) county, a suburban county under the administration of Aksu prefecture, told RFA that the committee received a notice to implement the QR code police in July, and has been carrying it out since then. A male Chinese officer at the Xincheng police station in Aksu said each QR code will cost three yuan (about 46 U.S. cents). “For such business, usually the residential committee issues a letter of support, and the building manager supervises it,” he said. “If you ask me about the purpose of this notification, I cannot explain it to you,” he said. Authorities in Xinjiang have recently introduced new security rules restricting the sale of kitchen knives, and requiring buyers to register their names and national ID card numbers, according to residents in Hotunsumul (Hejing) county in Xinjiang's Bayin’gholin Mongol (Bayinguoleng Menggu) Autonomous Prefecture. QR codes are now embossed on every knife. Authorities are also confiscating knives from Uyghurs as part of a “Three Illegals and One Item” campaign under which items deemed by authorities to be tools of terrorism, including knives, flammable objects, remote-controlled toys, and objects bearing symbols related to Islam, are being appropriated along with copies of the Quran and prayer mats. Uyghurs see the move as an unnecessary measure by Chinese authorities to exert more control over Xinjiang by further restricting the use of common household utensils. Islam has always been spread by the sword. QR codes on swords and knives is a good way to ensure that potential terrorists do not get away with murder easily. Any rights group from the West who are not happy can always get Angela Merkel to take in the 10 million Uighurs and share them with other Muslim-loving European Union members.